Hardest Hitters by Total Knockdowns Scored: Guillard-12, Edwards & Ellenberger-8, Lawler-7. Hardest Hitters by Knockdown Rate: Kedzie with a 17% knockdown rate. Guillard-13%, Lawler-9%, Ellenberger-7%. Worst “Chins” measured by Rate of Knockdowns Received: Salas-10%, Castillo-7%, Kedzie-6%. Anomaly is Meza-100%=1 punch KD. Highest Significant Strike Accuracy: Carmouche-59%, MacDonald-54%, Johnson, Danzig & Herman-50%. Most Likely to Attempt Takedowns: Salas averages 5.9 attempts per 5-minute round. Chiesa-3.9, Smith-3.2, Castillo-2.6. Best Takedown Defense (>10 atts): Ellenberger-93%, MacDonald-89%, Masvidal-84%. Most Accurate Power Head Strikers: Moraga-43%, Carmouche-38%, Voelker-37%, MacDonald & Danzig-36%. Best Head Striking Defense: Edwards, who defends >84% of head strikes by opponents. Worst Head Striking Defense: Herman, who only defends 59% of standing head strikes. Highest Paced Fighter: Voelker, who attempts on average 12.2 significant strikes per minute. UFC on FOX 8 is the first UFC card to have two women’s bouts. Liz Carmouche faces Jessica Andrade & Julie Kedzie fights Germaine de Randamie. 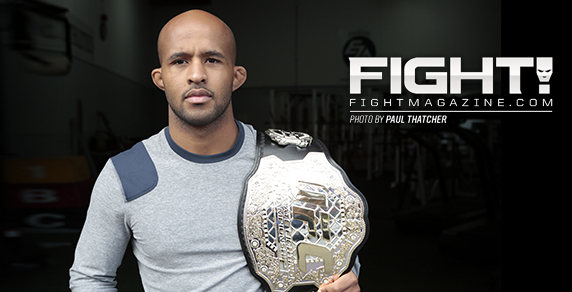 Demetrious Johnson is defending the UFC Flyweight Title for only the second time. No other fighter has ever held this belt. Rory MacDonald turned 24 years old on Monday. He is the second youngest fighter on the card. Rory MacDonald & Jake Ellenberger have identical takedown success rates of 58%. MacDonald attempts TDs at a slightly higher pace. Ed Herman only spends 18% of his time in the Octagon standing and trading. Visit fightnomics.com for more info, and follow Reed Kuhn on Twitter @Fightnomics.